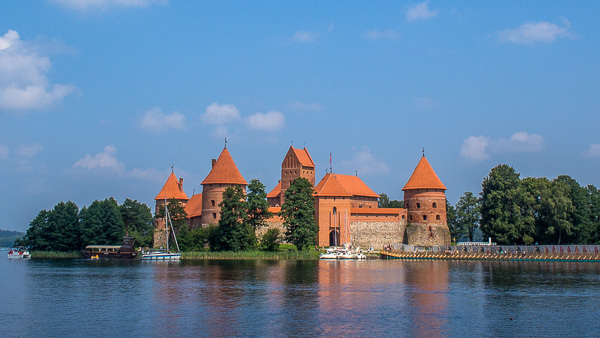 If you’re planning a trip to the capital of Lithuania and need some help, you’ve come to the right spot. 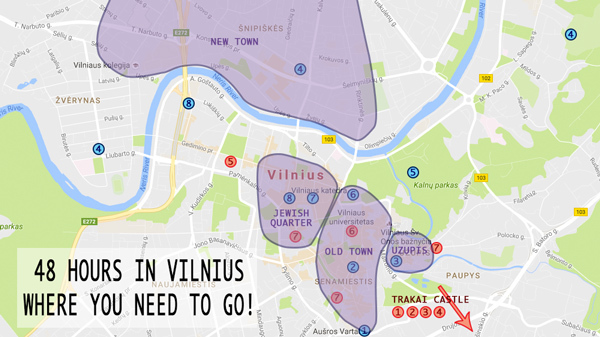 This Vilnius guide has everything that you need to do, all the things you need to see, where you need to eat and where you need to drink. We’ve wrapped this all up into a tight 48 hour things to do itinerary, so you can enjoy this fun little capital to its fullest on your weekend away! Probably, like you, before arriving in Vilnius we weren’t sure what we were in store for. We had heard during our time in the Baltics that there were less stag do’s than in Riga and the old town was going to be more modern and less medieval than in Tallinn. Once we got there, we saw that Vilnius was actually just a student town disguised as a capital city. So, along with a very well preserved old town and low prices, there was a relaxed student arty vibe as well. That translated to a great street art scene and more cool, hip and CHEAP restaurants and bars than you can poke a stick at. Start wandering your way to the Gates of Dawn and then down the main artery of old town, Pilies Street. 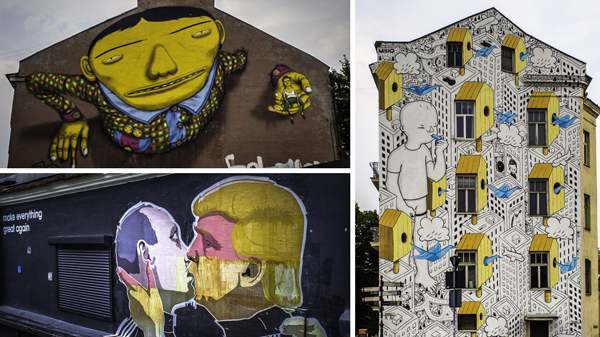 This is where you’ll see why Vilnius was named culture capital of Europe in 2009. This 1.5 km stretch of road has a church almost every 100 meters (There are 28 of them in town! 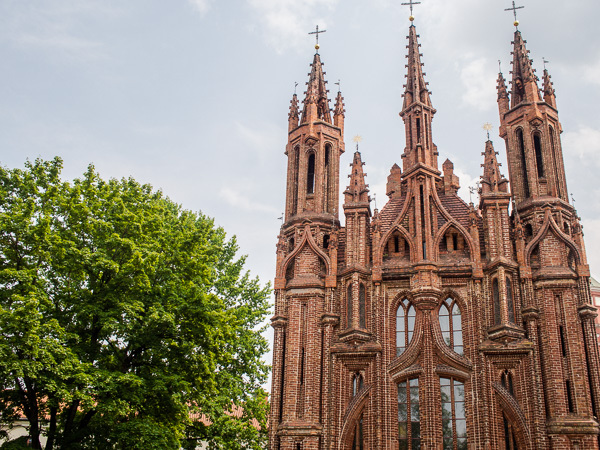 ), squares, expensive restaurants, souvenirs, buskers, bars, a university and basically connects almost all the main things to do in Vilnius. You’ll get plenty of time to explore the whole street, but for now stop at the town hall and jump on the free tour at 12pm. Great tour that was a good mix between history, fun-facts and some of Vilnius’s less frequented parts. After you’ve finished with the tour head back to the independent state of Uzupis for lunch. If you’re lucky enough to be in town on a Friday in summer head to the street food market for your grub. Otherwise, a great spot right next to the river is Uzupio Kavine. If you do go for lunch or beers at Uzupio Kavine you’ll also have the added bonus of doing so where the founders of Uzupis wrote their constitution! Like the US constitution it’s what the people of Uzupis live by throughout their daily life, with a high emphasis on the more hippy side of things. 1. Everyone has the right to live by the River Vilnele, and the River Vilnele has the right to flow by everyone. 12. A dog has the right to be a dog. 13. A cat is not obliged to love its owner, but must help in times of need. 20. No one has the right to violence. 36. Everyone has the right to be individual. While you’re contemplating the wise words of the Uzupis Constitution at lunch, register for the Cyclo City bikes. It’s only €3 for a 3 day registration and the first 30 minutes of use are free! With 37 stations dotted around the city it’s a great way to get around and away from the crowds of tourists in old town. Now go and grab a bike and get lost on the other side of the river in the “new city” of Vilnius. The difference between the two sides of town is amazing, shiny new skyscrapers on one side and the UNESCO World Heritage old buildings on the other. Another good option while you’ve got your wheels is the Antakalnis Cemetery. This “Soldiers Cemetery” began in 1809 and is home to Polish, Soviet and Lithuanians who have died in the many conflicts Vilnius has had over the years. If you get a bit peckish or thirsty on the new fancy side, head to Panama. Not the country, but a nice outside restaurant and bar to relax and take in some greenery. Once you’ve had your fill of that side of the river go back to old town, drop off your bike and start the climb up to the Hill of Three Crosses. The walk is about 30 minutes up the hill and you’ll get a great FREE view of old town for sunset. After you’ve had enough romantic time gazing over the beautiful red, tiled roofs of the city, walk back down the hill to Cathedral Square. Spend a few minutes or a few hours watching everyone go about life in the square. Lovers, photographers, kids, families, skateboarders, drones and giant mice…. It should be around beer o’clock now and there isn’t anywhere better in town to get a CHEAP BEER and CHEAP FEED than Snekutis. They have 3 locations located around the old town, ensuring you can stumble home easily no matter where you’re staying. If you want to party a little harder afterwards there are plenty of bars on Vilniaus Street packed to the brim with students on any given night. Some good options would be Sarkozy or a little further afield Liverpool Indie/Rock Bar. Related post: Like to party? Check out the best place to party in Ukraine, Lviv! Now you’re probably a little hungover so grab your breakfast to go from one of the dodgy-looking stalls near the bus station. Get the traditional kibinai pastries while you start to recover form the big night you had. 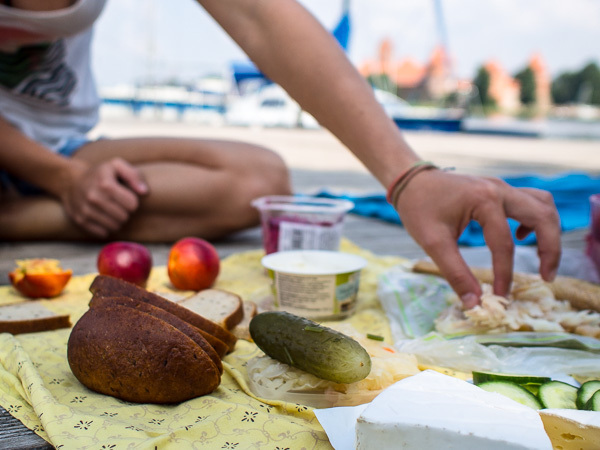 After you’ve eaten head to the super market to grab some food for a picnic lunch because you’ll be heading out of the city to Trakai Castle for the day! The castle is only 40 minute away with frequent and cheap buses from town, but food in the area is touristy and not the greatest value so a picnic is a great option. Now that you’ve arrived you’ve got a 20-ish minute walk ahead of you to get the castle. Don’t walk straight through the city though! There is a goat track next to the lake that winds past all the waterfront properties that is much nicer. The castle itself is FREE to walk around, but it’s €6 to enter. Once you’ve had enough walking, set up your picnic somewhere around the lake. We found a good jetty to set up on to the left of the main restaurants. It was a great place for some jetty jumping, sun baking, napping and eating. All with a great view of the castle over our shoulders. If you feel up for some exercise hire a kayak or paddle boat and venture around the lake. We were able to bargain our way down to €5 for an hours hire. This was plenty of time for us to slowly make our way around most of the lake and relax a little along the way. If you’ve got a little more cash to burn and want to be sailed around the island, there are boats for €30 an hour you can hire. 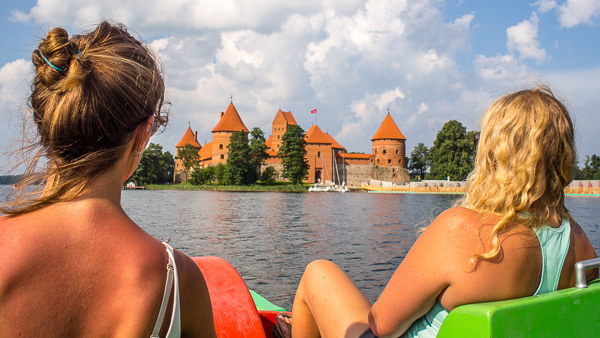 Once you call a close to your adventure at Trakai Castle come back to the city and rest for a little. If resting isn’t your thing and you’re still looking for something to do, you can go to the Museum of Genocide. The museum is set in the former head quarters of the KGB and now serves as a dedication to the Lithuanian lives lost or deported to Siberia until the 1960’s. The basement is not for the faint of heart, as it contains the cells where thousands of prisoners were shot or stabbed in the skull as the local execution method. Whether you’ve just woken from a nap or you’ve finished at the museum go for a wander to the real heart of the city, the Vilnius University. One of the oldest universities in Central Europe (founded in the 16th century), this beautiful campus is buzzing with life making people watching a great idea. Or if you need some quite time after the Genocide Museum, you could reflect on what you’ve just learnt in one of the 13 hidden internal courtyards. When you’ve finished with the University it should be about time to refuel after your long day. 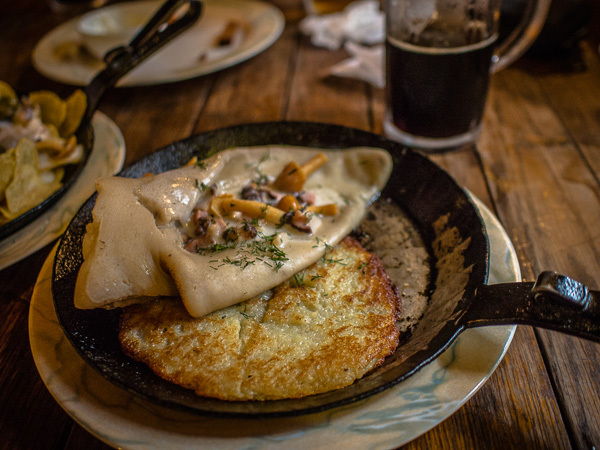 Head to the Jewish quarter and take your pick of great restaurants. We had some fantastic local beers at Busi Trecias while I tried pig’s ear for the first time. Let’s say I wasn’t a fan of the ear, but the restaurant was great and a fantastic way to finish off your Vilnius adventure! Vilnius has an international airport and Air Baltic usually has the best deals, but check Skyscanner just in case. Superbus and Simple Express have some greats deals for busses throughout the Baltics and even onto Russia. You can walk the whole old town by foot. It takes about 30 minutes to walk form one end to the other. You’ll only need a bike if you go across the river into the newer part of town. Downtown Forest – Hostel and Camping is just outside of the city surrounded by trees and a nice place to relax. Jimmy Jump’s House is the party hostel in Vilnius. Come to Vilnius is a cheap and nothing special hostel. Good if you just want a bed. Or if you’re after a private space Air bnb has some great listings.